I finished my undergraduate degree in June of 2016 and continued interning for The Good Samaritan Regional Cancer Center in Corvallis before starting my MPH at the U of A. I worked with the Oncology Outreach Coordinator to develop and implement free cancer health screenings in the community, both in Spanish and English. I chose public health because of the diversity of the profession. I am interested in chronic disease prevention through education, policy change, and social justice. Public health allows me to incorporate all three in the work that I do and does not limit my growth as a public health professional. After obtaining my MPH I will be able to choose from many different career paths that will positively impact my community. One of the main reasons that I was interested in MEZCOPH was the integration of in-class education, community-based fieldwork, and research opportunities. I have lived in a small town in the northwest for my entire life, so the Tucson environment seemed like a perfect change that would expand my public health experience. Chronic disease prevention and adolescent health education. 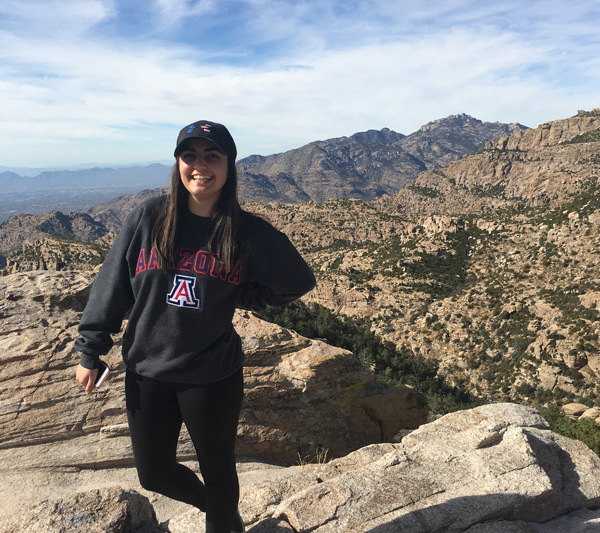 My current internship is through the University of Arizona Mel & Enid Zuckerman College of Public Health as the Healthy 2B Me summer camp coordinator in Tucson. This is a public health based summer camp for underserved and refugee youth ages 7-13. I will be conducting a program evaluation of the camp as well as making curriculum adaptations and collecting data for future research. Outside of school, I enjoy hiking, DIY projects, and petting dogs! Remember to ALWAYS pack lots of snacks with you. Even when you don’t think you’ll need them….emergencies happen!